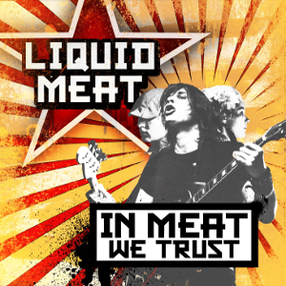 German rock band LIQUID MEAT led by Freddie Mack will release their new album "In Meat We Trust" on July 15th 2014. Originally the band was a Los Angeles based Rock 'n' Roll band and has released 2 albums. 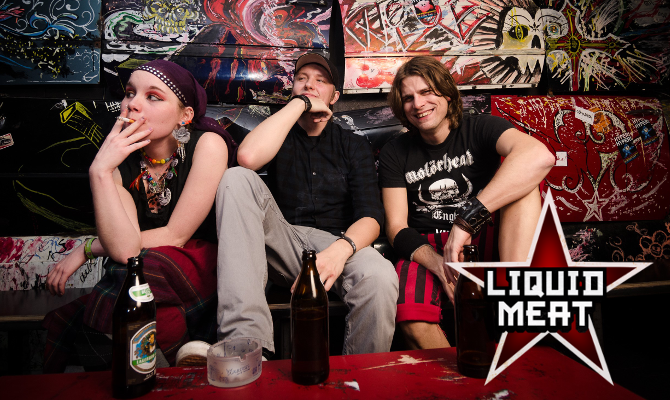 After Freddie Mack moved back to his hometown, Munich, he rebuilt LIQUID MEAT in 2013 with its first all German line up, which includes the female drummer Manu Holmer and Max Horch on bass. LIQUID MEAT develops an unique style that combines elements from rock, punk, funk, blues, and old school heavy metal. As a newcomer in Munich, the band has made significant progress in short amount of time in various scene. LIQUID MEAT not only played numerous shows but also they won the 3 online competitions, was featured 4 times in newspapers and even on a podcast. "In Meat We Trust" is the first album with a new line-up and was recorded at Auratone Studios in Germany by the legendary German record producer/sound engineer Reinhold Mack (Queen, ELO, Led Zeppelin, Rolling Stones, Black Sabbath, Deep purple, etc.). Pre-order is now available on LIQUID MEAT website.